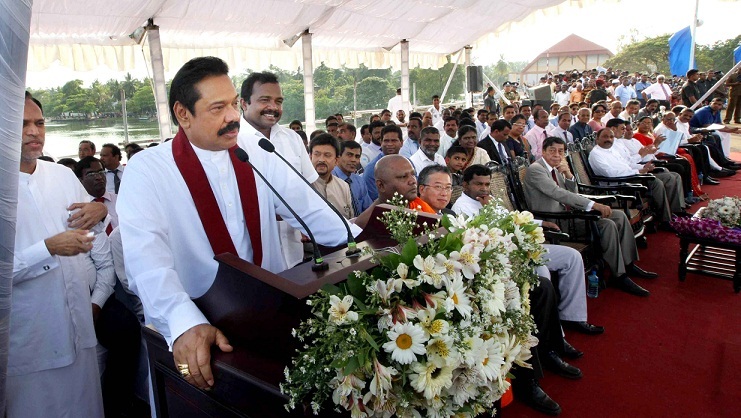 President Mahinda Rajapaksa declared open the new Kalladi Bridge which links the Batticaloa and the Ampara Districts on Friday afternoon (22 March). It is another dream of the people of the East has been realized by opening this new Bridge after elimination of terrorism. The two lane new Kalladi Bridge with two pedestrian and bicycle lanes, linking the South and the East constructed in parallel to the 112 year old bridge built by the British. It is 289 metres long and has a width of 15 metres. The old Kalladi Bridge had withstood the torments of terrorism and Tsunami in the recent past. The new Bridge is constructed on the Batticaloa-Kalmune Highway and links the Colombo “”…” Ratnapura road with Batticaloa A-4 road, via Beragala and Siyambalanduwa. The construction of the two-way Bridge will totally eliminate the congestion and mostly benefit the fisher folk and the agriculturalists in the area. The total expenditure incurred on the construction of the Bridge is 1970 million rupees. The Japanese Government has provided 1640 million rupees and the balance of 330 million rupees has been provided by the Ministry of Ports and Highways. A large gathering including the Japanese Ambassador to Sri Lanka Nobuhito Hobo, JAICA representative Harum Aho, Ministers Ranjith Siyambalapitiya, Vinayagamoorthy Muralitharan, Nirmala Kothalawala, Chief Minister of the Eastern Province Najeed Abdul Majeed and many Parliamentarians and local politicians was present at the opening of the Bridge. This entry was posted on Saturday, March 23rd, 2013. You can follow any responses to this entry through the RSS 2.0 feed. You can skip to the end and leave a response.